Érase una vez que había una mamá cerda que tenía tres cerditos. Ella los amaba mucho, pero no había suficiente comida para alimentarlos, así que los cerditos tuvieron que ir a buscar su suerte. Once upon a time there was a mama pig who had three little pigs. She loved them very much but there was not enough food to feed them, so the little pigs had to go seek their fortune. El primer cerdito decidió ir al sur. Encontró a un granjero en el camino que estaba llevando un atado de paja. El cerdito preguntó respetuosamente: "¿Podría por favor darme esa paja, para que yo pueda construir una casa?" The first little pig decided to go South. He met a farmer on the road who was carrying a bundle of straw. The little pig asked politely: "Could you please give me that straw, so that I can build a house?" Como el cerdito dijo "por favor", el granjero le dio la paja y el cerdito construyó una bella casa. La casa tenía paredes hechas de paja, un piso hecho de paja, y adentro... una cómoda cama hecha de paja. Because the little pig said "please", the farmer gave him the straw and the little pig built a beautiful house. The house had walls made of straw, a floor made of straw, and inside... a comfortable bed made of straw. Después de construir la casa, el cerdito decidió tomar una siesta en su cama hecha de paja. De pronto, el gran lobo malo llegó y olió al cerdito dentro de la casa, y su boca comenzó a hacerse agua."¡Mmmmm... emparedados de tocino!" After building the house, the little pig decided to take a nap in his bed made of straw. Suddenly, the big bad wolf arrived and smelled the pig inside the house, and his mouth started to water. "Mmmmm... bacon sandwiches!" Así que el lobo tocó la puerta de la casa hecha de paja y dijo: "¡Cerdito! ¡Cerdito! ¡Abre la puerta!" So the wolf knocked at the door of the house made of straw and said: "Little pig! Little pig! Open the door!" Pero el cerdito vio las grandes patas del lobo a través de la cerradura. El cerdito respondió: "¡No! ¡No! ¡No! ¡Ni por todo el oro del mundo!" But the little pig saw the wolf's big paws through the keyhole. The little pig replied: "No! No! No! Not for all the gold in the world!" El lobo mostró sus dientes y dijo: "Entonces soplaré y soplaré y derrumbaré tu casa." 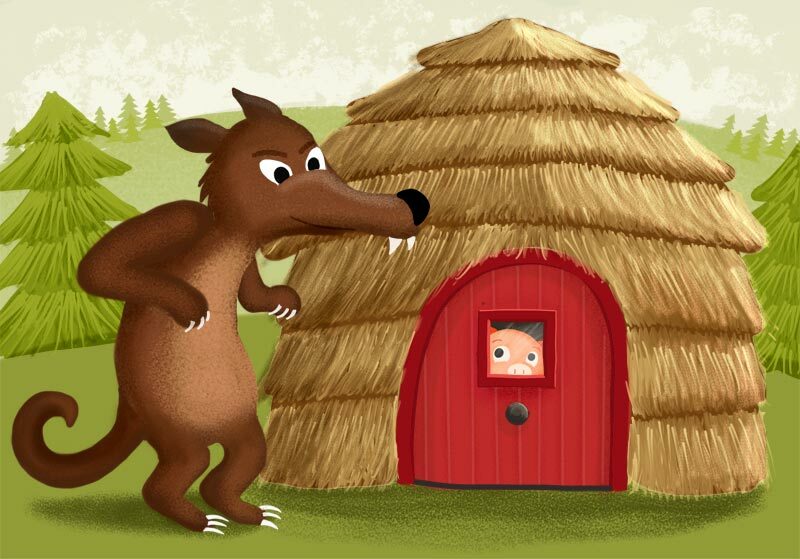 The wolf showed his teeth and said: "Then I'll huff and I'll puff and I'll knock your house down." Así que sopló y sopló, y derrumbó la casa, y el cerdito corrió de vuelta a la casa de su madre. So he huffed and he puffed and he knocked down the house, and the little pig ran back to his mother's house. El segundo cerdito decidió ir al norte. Encontró a un granjero en el camino que estaba llevando un atado de madera. El cerdito preguntó respetuosamente: "¿Discúlpeme, podría darme esa madera para construir una casa?" 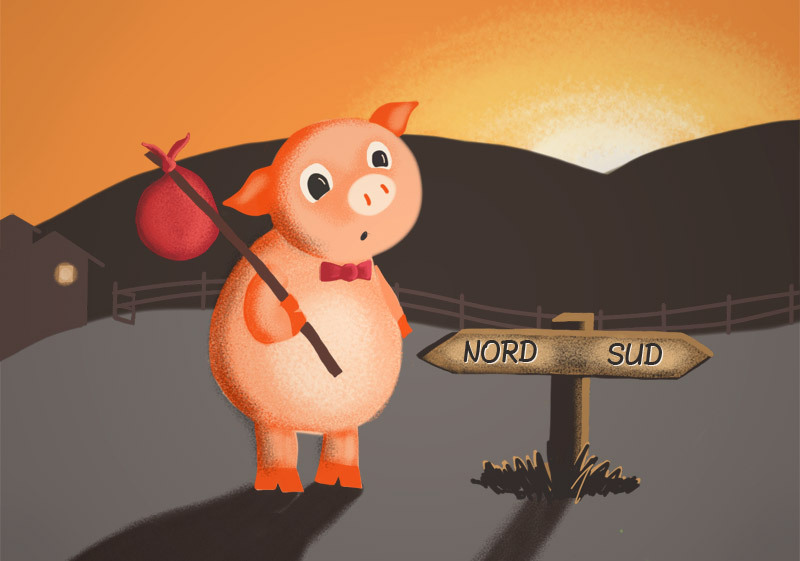 The second little pig decided to go North. He found a farmer on the road who was carrying a bundle of wood. 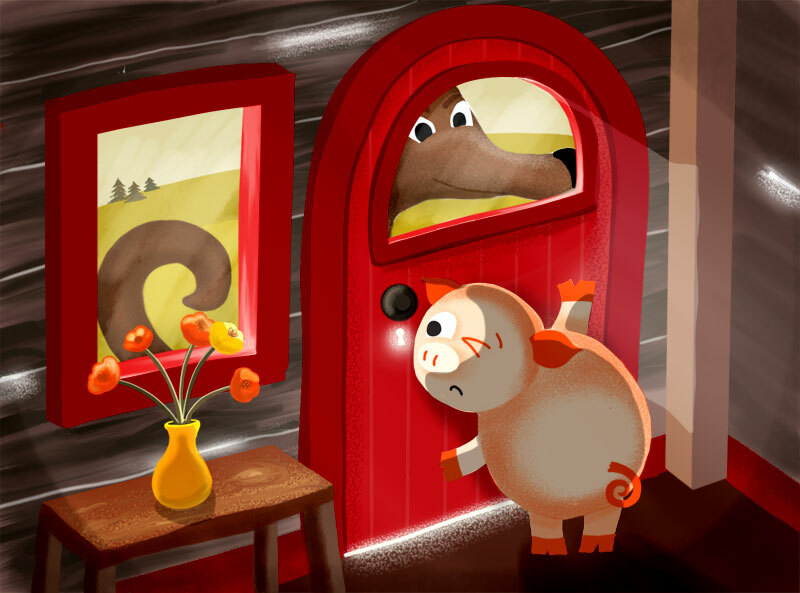 The little pig asked politely: "Excuse me, could you give me that wood to build a house?" Como el cerdito dijo "discúlpeme", el granjero le dio la madera, y el cerdito construyó una bella casa con ella. La casa tenía paredes hechas de madera, un piso hecho de madera, y adentro... una fuerte mesa hecha de madera. Because the little pig said "excuse me", the farmer gave him the wood, and the little pig built a beautiful house with it. The house had walls made of wood, a floor made of wood, and inside... a strong table made of wood. Después de construir la casa, el cerdito empezó a decorar su mesa hecha de madera con flores. De pronto, el gran lobo malo llegó y olió al cerdo dentro de la casa, y su estómago empezó a retumbar. "¡Mmmmm... Puerco rostizado!" After building the house, the little pig started decorating his table made of wood with flowers. 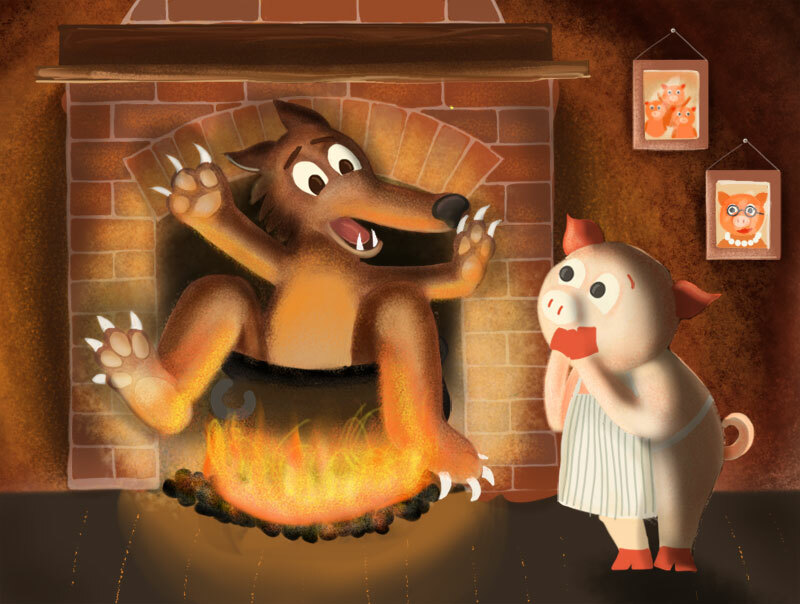 Suddenly, the big bad wolf arrived and smelled the pig inside the house, and his stomach started to rumble. "Mmmmm... roast pork!" Así que el lobo tocó la puerta de la casa hecha de madera y dijo: "¡Cerdito! ¡Cerdito! ¡Abre la puerta!" So the wolf knocked at the door of the house made of wood and said: "Little pig! Little pig! Open the door!" Pero el cerdito vio la larga nariz del lobo a través de la cerradura. El cerdito respondió: "¡No! ¡No! ¡No! ¡Ni por todo el oro del mundo!" But the little pig saw the wolf's long nose through the keyhole. The little pig replied: "No! No! No! Not for all the gold in the world!" Así que sopló y sopló y derrumbó la casa, y el cerdito corrió de vuelta a la casa de su madre... ¡Mamá cerda no estaba muy feliz! So he huffed and he puffed and he knocked down the house, and the little pig ran back to his mother's house... Mama pig was not very happy! El tercer cerdito decidió ir al oeste. Encontró a un granjero en el camino que estaba llevando una carga de ladrillos. El cerdito preguntó respetuosamente: "¡Hola señor!, ¿podría darme algunos de esos ladrillos para construir una casa?" The third little pig decided to go West. He found a farmer on the road who was carrying a load of bricks. The little pig asked politely: "Hello sir!, could you give me some of those bricks to build a house?" Como lo llamó "señor", el granjero le dio al cerdito algunos ladrillos, y el cerdito construyó una bella casa con ellos. La casa tenía paredes hechas de ladrillo, un piso hecho de ladrillo, y adentro... una gran chimenea hecha de ladrillo. Because he called him "sir", the farmer gave the little pig some bricks, and the little pig built a beautiful house with them. The house had walls made of brick, a floor made of brick, and inside... a large fireplace made of brick. Después de construir la casa, el cerdito empezó a cocinar una gran olla de sopa en su chimenea hecha de ladrillo. De pronto, el gran lobo malo llegó y olió al cerdo dentro de la casa, y lamió sus labios. "¡Mmmmm... chuletas de cerdo con salsa barbacoa y frijoles verdes!" After building the house, the little pig started cooking a big pot of soup in his fireplace made of brick. Suddenly, the big bad wolf arrived and smelled the pig inside the house, and he licked his lips. "Mmmmm... pork chops with barbeque sauce and green beans!" Así que el lobo tocó la puerta de la casa hecha de ladrillo y dijo: "¡Cerdito! ¡Cerdito!¡ ¡Abre la puerta!" So the wolf knocked at the door of the house made of brick and said: "Little pig! Little pig! Open the door!" Pero el cerdito vio las grandes orejas del lobo a través de la cerradura. El cerdito respondió: "¡No! ¡No! ¡No! ¡Ni por todo el oro en el mundo!" But the little pig saw the wolf's big ears through the keyhole. The little pig replied: "No! No! No! Not for all the gold in the world!" Then the wolf showed his teeth and said: "Then I'll huff and I'll puff and I'll knock your house down." Así que sopló y sopló. Sopló y sopló. Y sopló, y sopló y sopló; pero no pudo derrumbar la casa. Al final el lobo estuvo tan cansado que no pudo soplar más. So he huffed and he puffed. He puffed and he huffed. And he huffed, huffed, and puffed; but he could not knock down the house. At last the wolf was so tired that he couldn't huff any more. El cerdito rio mientras removía su gran olla de sopa. The little pig laughed while stirring his big pot of soup. Pero el lobo tenía tanta hambre de chuletas de puerco... ¡Él no se rendiría! Así que el lobo escaló al techo. "¡Ahora atraparé a ese cerdo!" But the wolf was so hungry for pork chops... he would not give up! So the wolf climbed onto the roof. "Now I'll get that pig!" El lobo bajó por la gran chimenea hecha de ladrillo y....¡PUM!... aterrizó de trasero en la gran olla de sopa del cerdito... ¡que estaba muy caliente! El lobo aulló y saltó fuera de la olla, y entonces corrió fuera de la casa sobando su trasero quemado. The wolf slid down the great chimney made of brick and... PLOP! ... landed bottom-first into the big pot of soup... which was very hot! The wolf howled and jumped out of the pot, and then ran out of the house clutching his burnt bottom. El cerdito llamó a su madre y sus dos hermanos en su celular hecho de ladrillo, y los invitó a una deliciosa cena de sopa de trasero de lobo. The little pig called his mother and his two brothers on his mobile phone made of brick, and invited them for a delicious dinner of wolf-bottom soup. La sopa de trasero de lobo estuvo tan deliciosa que pronto todos querían atrapar al lobo y hacerlo sentarse en su sopa. El pobre lobo tuvo que correr muy lejos a lo profundo del bosque oscuro donde pudo vivir en paz y tranquilidad. The wolf-bottom soup was so tasty that soon everybody wanted to catch the wolf and make him sit in their soup. The poor wolf had to run far away to the deep dark forest where he could live in peace and quiet. Caperucita Roja eats fresas, picks margaritas and talks to el Gran Lobo Feroz on the way to Grandma's house.